Chapter 34: Professor Palmer is waiting at the farmhouse for Larry and Kevin. He tells them what they have already found out from Stinky Glover: Lieutenant Carmody is after them, determined to keep them in this world. The snowstorm prevents them from heading directly to the portal, so they have to stay at the farmhouse. They hide when Carmody shows up. Carmody orders the place to be searched. Peter, the lieutenant’s good-natured driver, discovers them, but doesn’t tell anyone. Carmody leaves, and the boys spend a worried night waiting for the dawn, when they will finally make it back to the portal. And now (finally) the climax. Kevin and I put on the clothes from our world, then our coats. Professor Palmer was coming with us; Mom was going to stay home with Matthew. “Please be careful, Larry,” she said. I knew she’d say that. She just shook her head and turned away. I ran up to the attic then and kissed Matthew, who stirred but didn’t awaken. When I came downstairs, I took a quick look around, and then followed the others out of the farmhouse. Outside, Gretel was already hitched up to the sleigh. Dad got up on the bench to drive. Kevin and I sat on one of the facing seats; Professor Palmer sat on the other. “A one-horse open sleigh,” I said to Kevin. The snow had mostly stopped. The air was cold; the sky was brightening. Dad picked up the reins. Mom waved to us from the doorway; her cheeks were wet with tears. We all waved back, and then we started off. It was slow going at first, as Gretel got used to her burden. The world was silent except for the shooshing of the sleigh’s runners over the snow. Silent and beautiful, with the snow weighing down the branches of the trees. I spotted a deer gazing out at us from a stand of pines. “If we find the portal, will you come with us?” I asked Professor Palmer. I thought about my own heart. What was it saying? There was something that Kevin had said about hearts once, long ago . . . but I couldn’t quite remember it. Finally I let it go. We were on the Post Road now, and going faster. Three miles to the Fitton place. And then what? How would Kevin react if we couldn’t find it? How would I react? “Oh, no,” Kevin said after a while. Behind us we saw a dark shape on the road. “Still, can we go any faster?” he pleaded. Dad flicked the reins, but Gretel was pulling a lot of weight through the snow, and she just didn’t have the strength to speed up. But Dad was right, the shape behind us didn’t come any closer. I was pretty sure it was the lieutenant’s carriage, though. We rounded the bend in the road. Nothing looked familiar to me. How much further? To our right was a small slope, and at the top I saw someone standing in the trees. “Stop!” I shouted. Dad pulled on the reins. I got out and started running up the slope. The figure disappeared back into the trees. I turned and saw Kevin behind me, and Professor Palmer struggling through the snow behind him. And I saw the carriage pulling up behind Dad’s wagon. I reached the trees. Where was the figure? I kept going into the woods. A pine bough slapped me in the face and drenched me in snow. I was out of breath; my feet felt numb. Where did he go? Then I saw him, standing in a small clearing. The preacher. “Is it here?” I demanded. “I wasn’t standing out there for my health,” he replied–a little crossly, I thought. “Look, here’s some final wisdom, not that you’re in the mood for it. Don’t think badly of me. It is difficult to find one’s way–in any world. We–all of us–can only do our best.” He took a step backwards. “Wait a minute!” I called out. “And remember,” he said, “it is only by setting out–” But that was all I heard. He had disappeared. “Who was that?” Kevin asked, coming up beside me. We stood there. A few seconds later Sergeant Hornbeam and my father showed up; the sergeant was holding a pistol to my father’s back. “Morning, all,” he said. Behind them came Peter, looking unhappy. I looked over at Kevin. I could tell what he was thinking. Should he just make a run for it? Dive into the portal and hope for the best. Maybe the lieutenant wouldn’t really shoot him. Maybe he’d just be wounded and could still make it home. “Please don’t, Kevin,” I said. “Why not?” he replied. “Why not?” There were tears in his eyes. To be this close . . .
General Aldridge sighed. “Sergeant, you have no direct orders from the president, I take it?” he said. “By then there’ll be nothing left to sort out,” the lieutenant muttered. But he handed his pistol over to the sergeant. The general looked at Peter, then at the lieutenant. “Is that true?” he asked. General Aldridge casually returned the salute. Kevin walked forward to where the preacher had disappeared. He reached out his hand, and it too disappeared in mid-air. He pulled it back, and it reappeared. Then he moved it forward again–gone. “Here,” he said. “Thanks for everything you did for us,” I said. “Very well.” He looked around at all of us then–and, I think, at the trees, the snow, the sky–everything there was to see on the cold Christmas morning. Then he followed Kevin’s instructions. He was there and then he wasn’t, vanishing into invisibility in a split-second. None of us moved, as if we expected him to come back if we stayed still long enough. But he didn’t return. He was gone. Professor Palmer went over and reached his hand into the portal the way Kevin had done, then took it out again and shook his head. Kevin walked back to General Aldridge. “Are you going to let Larry and me go, sir?” he asked. Listen to your heart, the preacher had said. It is only by setting out that you can finally return home. And then I remembered what Kevin had said about hearts–back on our world when I brought him to the portal. I wonder what happens if, like, one half your heart is in this world and the other half is in the other. Just a stupid little comment–the kind of thing Matthew would say. But it made a different kind of sense to me now. This is the way it was going to be for me, no matter what choice I made. There wasn’t a right answer or a wrong answer–it was just a question of which half of my heart I was going to leave behind. I hugged my father–something I never did at home–and he tousled my hair. He was weeping–something he never did at home. I was starting to cry too. Then I said my goodbyes to the rest of them: Peter, who had saved me more than once, and General Aldridge, who had rescued us from the lieutenant, and Professor Palmer, who had been our other father in this world. I hugged them all. “We will miss you terribly,” the professor said. “But you’re doing the right thing. Fare you well.” His eyes were moist too. “Good luck to the Red Stockings,” the general said to Kevin. “Then let’s go.” Like Lieutenant Carmody, we took a last look around, at the faces so familiar to us now, at the world that had been our home, and then we stepped into the portal and left them all behind. 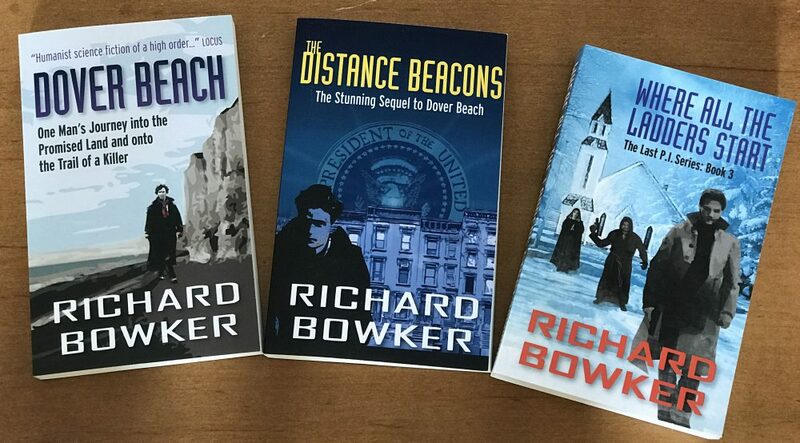 This entry was posted in Writing and tagged alternate universes, authors, fantasy, fiction, novel, novels, Portal, science fiction by Richard Bowker. Bookmark the permalink.